On August 17, 1992, I was 26 years old, a son to my mother, a father to three sons, a brother to four siblings, and a friend to many in my small Texas community. I was an athlete who loved playing sports. And if anyone back then had to describe me, they would probably say I always had a smile on my face. Like most people, I had never thought much about the death penalty. I thought bad things like that were for other people. I remember watching the news and sometimes hearing about cases where men were falsely accused and wrongfully convicted, but I never thought in a million years that could one day be me. Then a police officer came knocking on my door and changed my life forever. A young criminal, terrified about his fate after murdering a family of six, falsely accused me of being his accomplice. Hours after he uttered my name, I was sitting in the back of a police cruiser heading to jail. I had no idea I was about to spend the next 18 1/2 years behind bars, including 12 years on death row, trying to prove my innocence. My innocence is the very thing I relied on after my arrest. I cooperated with law enforcement 110%, so sure was I that the whole thing was some crazy mistake. I did everything they asked of me — but quickly came to understand that what the officers wanted more than anything was an indictment, then a conviction. I witnessed the nearly unchecked power of the district attorney’s office and the direct impact it has on mass incarceration. It has the ability to wreak havoc and totally change the lives of ordinary people. I witnessed how law enforcement officials can get tunnel vision once they have a murder suspect in custody — and nearly any suspect will suffice once an arrest has been made. Cutting corners to make their case wasn’t a big deal, so long as they got their conviction. I witnessed the role of the media in shaping opinions around cases before trial. In my case, I was found guilty in the court of public opinion long before I ever saw a jury of my peers. I also witnessed how judges seem to give wide leeway to prosecutors, instead of heeding the actual facts. All of these things eventually led to my wrongful conviction. Perhaps this is inevitable for poor black men in Texas, once the yoke of an arrest for murder is tightly fitted around our necks. I learned this the hard way. In November 1994, two and a half years after my arrest, I was sentenced to death by the state of Texas for a crime I did not commit. The criminal justice system had stolen my freedom, and now Texas wanted to take my life. Enter: death row. I knew that if I gave in, I too would become a product of an environment that wanted to destroy the very essence of my being. Over the next 14 years, 500 men were put on death row in the state of Texas, each controlled by a system built to torture them for the rest of their lives. There were men, young and old, living in cages like animals for 23 to 24 hours a day, locked into tiny spaces arranged like dog kennels, without access to family save for two hours per week through the transparent divider — and with zero access to human contact at all times. Men were just existing behind steel doors. I couldn’t believe what I was witnessing with my own eyes and experiencing firsthand as a member of this rare and unenviable group. My world felt and smelled like death and inhumanity, with men trying to live under the worst conditions, short of slavery. I witnessed men being driven out of their minds, and some even attempting suicide as a better alternative. These men had been cut off from the outside world, and now they were all facing execution. I had become one of them. I was isolated, alone, and afraid. Over time, I began to understand that death row is designed to break a man’s will to live, and I started witnessing it all around me. I knew that if I gave in, I too would become a product of an environment that wanted to destroy the very essence of my being. I wanted to live, and I had to figure out how to do it under these circumstances. Meanwhile, I witnessed an onslaught of executions: men who were mentally ill, men who were innocent, men who were guilty, men whose cases should have been a lesser offense. But largely because of the poor environment from which most of us had come, we were all meeting the same fate. The state was executing everyone. I thought about my own mortality constantly. I have never shaken the memories of the faces I used to see on the other side of the plexiglass during visitations: parents, siblings, and children came to see their sons, brothers, and fathers. My own family started coming to visit, and Mama would bring my three boys to see me. They eventually grew into young men right before my eyes, albeit from the harsh distance of prison captivity. I watched as my mother’s hair started turning gray, and soon I no longer heard much from the rest of my family. I realized that life was beginning to pass me by. Having the courage to cling to hope is not always easy in situations like this. Oftentimes I would question God, but in truth, hope was all I had. I couldn’t afford to give it up. I remember getting my first execution date, one of two literal dates with death. It was an out-of-body experience. By that point, I had seen many men taken from their cells to be executed. Some were happy to leave this hell on earth. But when I was given my dates, my first thought was to tell myself that I had the power to live until I died. That brought me an immediate sense of peace. I was no longer afraid of death or death row. I knew then that, of the things I could control, I wasn’t going to give the most important one to the state of Texas. From that day on, I started reaching out in earnest to pen pals in Europe, family and friends, to anyone who would listen to me share my story, in the hope that someone would help save my life. As importantly, I wanted the world to know that Texas was trying to execute an innocent man. I didn’t know if I was going to come home standing or lying in a pine box, but I knew the world should know my story. I was fully exonerated in 2010. The prosecutor on my case was disbarred. Since my release, I have traveled the world sharing my story about living on death row as an innocent man, and what I’ve learned from it. I have become a criminal justice activist, author, highly sought-after public speaker, a grandfather five times over, and once again, a free man. My experience birthed within me a purpose I never knew I had. I take seriously my responsibility to speak for the men and women on death row today fighting to prove their innocence, the same way I had to. I know I’m one of the lucky ones. 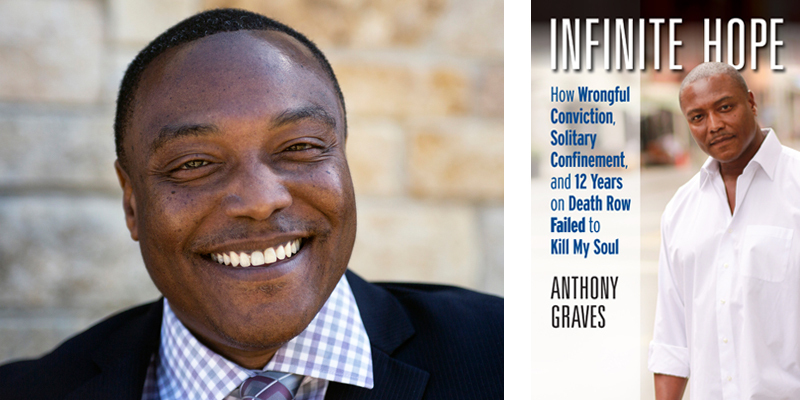 Anthony Graves was wrongfully convicted of multiple homicides in 1992 and spent nearly two decades behind bars, including 12 on Texas’s death row. While still in prison, he cofounded Join Hands for Justice, a France-based activist group that led global efforts to prove his innocence. Graves’s conviction and death sentence were overturned in 2006, and after four years of legal wrangling, he was fully exonerated and released in 2010. Since then, he has become a full-time advocate for criminal justice reform, testifying to the US Senate about the harms of solitary confinement, serving on the board of directors for the Houston Forensic Science Center, and working with the ACLU’s Campaign for Smart Justice. Graves speaks widely and runs the Anthony Graves Foundation, which works to draw attention to problems within the American criminal justice system. He lives in Houston. Infinite Hope: How Wrongful Conviction, Solitary Confinement, and 12 Years on Death Row Failed to Kill My Soul is his first book.